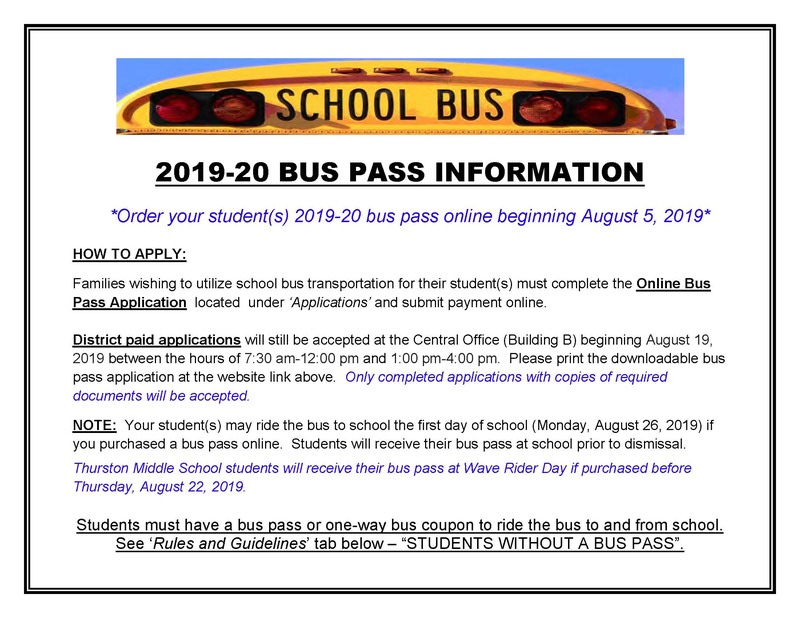 Beginning 2018-19 school year, bus passes and replacement bus passes are ONLY available for purchase ONLINE and no longer available for purchase at the District's Central Office. Click on the link below to purchase. Bus passes purchased online will be sent to school site(s) the same day if they are purchased before 8:00AM. If they are purchased after 8:00AM they may be picked up at the Central Office (Bldg B). Passes not picked up will be sent to school site(s) the following morning with courier. NOTE: District paid application will be accepted at the Central Office (Building B) beginning August 27, 2018 between the hours of 7:30 am-12:00 pm and 1:00 pm-4:00 pm. Click and print the downloadable bus pass application above. Only completed applications with copies of required documents will be accepted. TYPES OF PASSES: Annual Round Trip (ART), Annual One Way; morning or afternoon (AOW-AM or AOW-PM), Semi-Annual Round Trip (SRT), Semi-Annual One Way; morning or afternoon (SOW-AM or SOW-PM), Occasional Use COUPONS (25 or 50 passes per pack) and (FRI-AM) for Friday zero period Thurston students only. Families with more than two K-8 students utilizing the District Transportation are eligible for a discount: the first two students are full fare; the third student receives a 50% discount on the least valued pass, four or more student passes are District paid, at the lowest value pass. NOTE: The 1st Semi-Annual bus pass begins the first day of school and expires January 31st. The 2nd Semi-Annual bus pass begins February 1st and expires the last day of school in June. BUS COUPONS: Coupons are available for infrequent, one-way transportation. Coupons are $2.00 each and can be purchased at the school site or district office. In addition, coupons are sold in packs of 25 or 50 and may be purchased at the district office. An application must be on file, with a Designated Bus Stop number and parent/guardian signature, to purchase a bus coupon. Coupons expire at the end of the school year. Bus Passes are considered the property of LBUSD. Accordingly, each student is expected to safeguard his or her bus pass, and must show it to the driver upon boarding the bus each day. 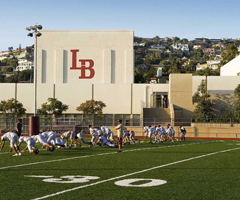 LBUSD assumes no responsibility for lost or stolen passes. There will be a $5.00 replacement fee for lost bus passes. Readable but damaged passes are replaced upon payment of a $3.00 service charge. DBS# Changes/Additions are completed at the District Office, for a $3.00 service charge. You must forfeit the original pass when a change is processed. Misuse of a bus pass may result in the suspension or termination of home-to-school transportation privileges without a refund. Refunds are approved ONLY if a student MOVES out of the District, or MOVES to a non-transportable area. All requests for refund must be directed to the Business Services Department. Refunds are prorated based on full, unused months. In addition, a $10.00 processing fee is charged. The District DOES NOT refund fares for students who are suspended or expelled from transportation or school for disciplinary reasons. The bus pass must be forfeited upon refund request. Use only the designated bus stop and bus assigned. Any change requires signed parental permission before end of school day. Arrive at bus stop ten minutes before bus is due. Behave in an orderly manner at bus stop. As bus arrives, form a line and stand at least six feet back from curb. Do not move toward bus until it has come to a complete stop and door is open. Be respectful of neighbors while walking to and from the bus stop and while waiting for the bus. Use only public access on the way to and from the bus stop. Always obey all traffic laws. Display bus pass to the driver upon boarding the bus. Board the bus, find a seat quickly and remain seated at all times, facing front, while bus is in motion. Follow instructions of the driver. Drivers may assign seats, assign three to a seat, assign seat mates, and take other actions needed for safe passage of the students. Talk quietly. Do not shout, yell, use profane language or gestures, fight, or behave in a boisterous manner. Keep all body parts inside the bus. Not eat, drink, or chew gum, while on the bus. Not bring animals, glass objects, or large bulky or hazardous articles of any kind on the bus. This includes boogie boards, bike wheels, and skateboards. Not litter the bus or engage in vandalism, destruction of property, or graffiti. Costs will be billed to the student and their parent. Not possess or use tobacco, drugs or alcohol, firearms, knives, explosives, or other dangerous objects abroad the bus. Not light matches, lighters or firecrackers aboard the bus. Not play or tamper with any part of the bus. Not ask driver to discharge students anywhere but at a designated bus stops, in accordance with the law. Remain quiet at the bus stops. When existing the bus, follow the drviers' instructions. If crossing on the opposite side of the street, always cross in front of the bus, and utilize the crosswalk, obeying all traffic laws. This section is pursuant to Ed. Code Sections 39831.3-39831.5 and Vehicle Code Section 22112. All policies and rules regarding safety, behavior, and discipline on the school bus remain in effect. Parents are encouraged to review the student responsibilities and Durham's rules and regulations with their student(s). With parent assistance the cooperation of all student riders, the District is able to continue to provide safe transportation. The following standards of progressive action regarding abuse/misuse of bus transportation are established and are separate from school disciplinary measures. 1st Offense: Driver confiscates pass, and privileges are suspended for ten (10) days. 2nd Offense: Bus privileges suspended for remainder of school year. 1st Offense: Bus Pass confiscated, attached to bus conduct report, and turned in to school. 1st Offense: Driver confiscates Bus Pass and issues bus conduct report. 2nd Offense: Bus privileges suspended for five (5) days. 3rd Offense: Bus privileges suspended for ten (10) days. 4th Offense: Bus privileges suspended for remainder of school year. Possession of any pass which is not the property of the possessor, shall constitute evidence of improper possession and use, or attempted use, and is reason to exercise disciplinary measures. If the student is not listed on the designated bus stop list and is at the bus stop, student is transported to school, and the driver notifies the school office. The school office contacts the parent(s) to explain the Transportation Fee Program. Students without a bus pass or one-way bus coupon will not be allowed to ride the bus home from school.